We spent most of the morning visiting a botanical garden close to our house. They have a tremendous variety of plants and flowers, almost 3000 species, on 27 acres. Their emphasis, and our favorites, are orchids. 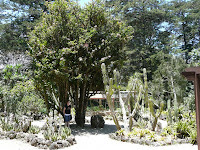 They have a number of different sections, including a Japanese garden that's under development, and one for cacti. (first photo: that's one huge cactus!) They even have 40 species of bamboo! 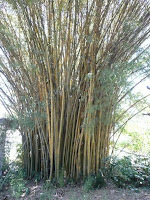 (second photo: look at the size of that bamboo!) Click here to see a slideshow from today.